Center For Lit is proud to announce the brand new edition of Teaching the Classics. This revised, expanded, re-filmed second edition has replaced the original version of the seminar, which has been our flagship product since 2004. Teaching the Classics is an eight-hour seminar that shows parents and teachers a powerful method for discussing literature. This method can be applied to any book at any grade level, regardless of the teacher's experience. It is Center For Lit's flagship product, and the foundation of all our work. The seminar builds on the idea that all works of fiction share the same basic elements, including Context, Structure, and Style. Lessons devoted to each of these elements explain how to identify them in any story and use them to understand an author's theme. Inspiring lectures and demonstrations by Adam Andrews include live readings of Mark Twain, Rudyard Kipling, Leo Tolstoy, Beatrix Potter, and more. The syllabus notebook included with the course contains everything a teacher needs to conduct powerful literary discussions, including our exclusive Socratic List - a set of 173 graded discussion questions that can be used with any story in the world. Questions on the list are arranged in order of difficulty: from elementary questions which ask for the mere facts of a story to advanced questions which require discussion of transcendent themes. Properly employed, this list can help teachers engage their classes in important discussions of ideas, and also provide a rich resource for essay assignments. 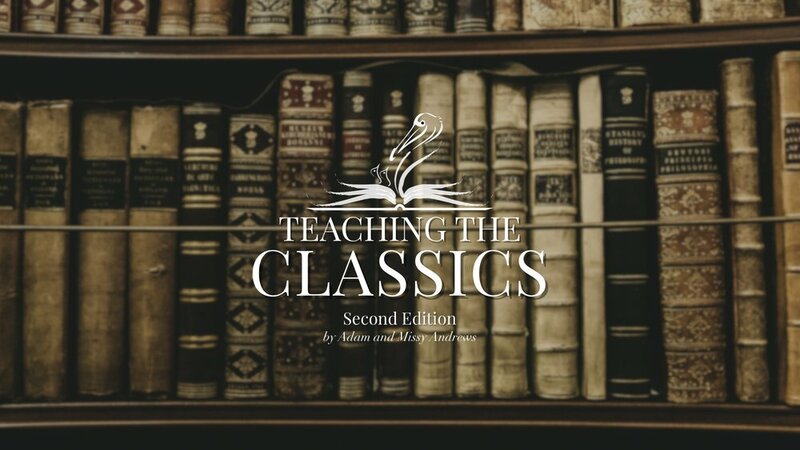 Interested in purchasing Teaching the Classics as a digitally streaming resource? Check out our Pelican Society Premium Membership Plan!